Rubik's Photo Cube exclusively uses licensed Original Rubik's cube products. Create your virtual 3D designs using our web application. Creating custom design or use designs created by our design partners. Upon validation of virtual 3D design, your personalized cube is printed and shipped the same day. The press-proof/finished product will be identical to your final order. Minimum order of 1 Rubik's cube. PHOTOS of your clients realized on-site appearing instantaneously on our 3D virtual Rubik's cube. Large touch screen to display, edit and play with customized cubes. 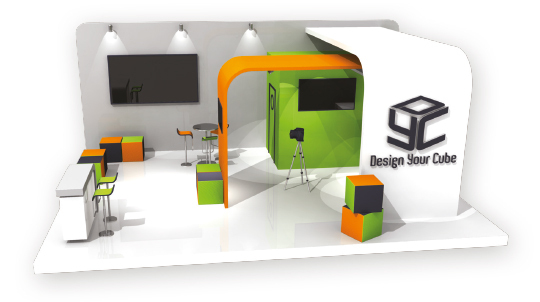 Our mobile production unit allow the instant printing of virtual 3D cubes of clients with their pictures. Your clients receive a personalized Rubik's cube, fun and excellent event souvenir. Exciting amusement in the presence of a "speed cuber" proposing initiation and the manipulation of Rubik's cubes around surprising games and challenges. In partnership with the Profile agency (transitory architecture), we can help you construct your event structure in the spirit of fun and design.